After a week of fun and over-indulging a bit in Colorado, it was time to get back into a more attentive approach to cooking for a few days. For my body, nothing works better than controlling carbs. I respond quite well to it, and don’t find it that hard to do. Whenever I feel like reducing carbs, I think of Kalyn’s blog, her site is a great source of wonderful recipes. I had this one saved in my Pinterest board for a while, and even got the exact same pan she used. It was too cute to resist. And I must tell you, it works great, very sturdy, I can see it will be around my kitchen for many many years, and maybe it will find its way into Greenlee’s home one day. If you don’t know, Greenlee is my 2 and a half-year old grand-daughter. Yeap, that’s how sturdy this pan seems. But back to the recipe. 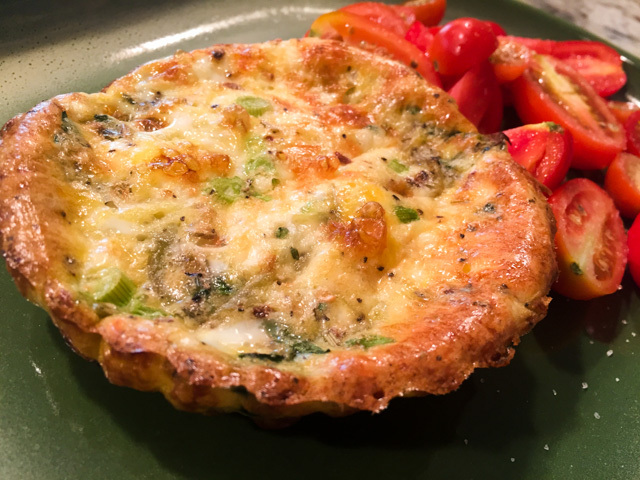 If you like omelettes and frittatas, this one is for you. And, of course, you don’t need to splurge and get the pan, use a large muffin tin, or you might even pour it into a pie dish, I suspect you can fill two regular size pans, although not too deeply. You might have to adjust the baking time a little. It is easy to judge when it’s done – just a little jiggly in the center, and getting a nice golden brown look on the surface. Heat the oven to 375F/190C. Crumble 4 oz. of feta cheese into a large glass measuring cup or a bowl and let it come to room temperature. Heat olive oil in a non-stick frying pan, add the zucchini, sprinkle with Herbes de Provence, Aleppo pepper, a little salt and black pepper to taste. Cook the zucchini a few minutes over medium-high heat, just until it’s barely starting to soften. Spray the tart pan with olive oil and divide the cooked zucchini among the tart wells. Top with a generous tablespoon of coarsely grated sharp cheddar and a pinch of green onions. Then use a fork to stir the now-softened goat cheese and add the coconut milk (or heavy cream) and whisk well. Beat eggs in another bowl and add to the goat cheese/milk mixture a little at a time, stirring until fully blended. Fill each tart well with the feta-cheese and egg mixture, being careful not to fill too full. Bake about 30 minutes, or until tarts are firm and lightly browned. Serve hot. Comments: I am quite fond of frittatas and omelettes, but sometimes they can taste too eggy. I know, what kind of a statement is that? But, there is such a thing as “too eggy,” at least for my taste buds. I find that using coconut milk mellows down quite nicely that flavor, making it more subtle, and the texture quite creamy. Heavy whipping cream does a similar job, but in my personal experience, coconut milk is the winner. The recipe makes six tarts, which means after Phil and I enjoyed two on a Sunday lunch, I still had four left. I kept them in the fridge for four days, wrapped individually in Saran wrap, and they were still excellent on the last day, warmed up for 60 seconds – exactly – in the microwave. I bet they freeze well too. 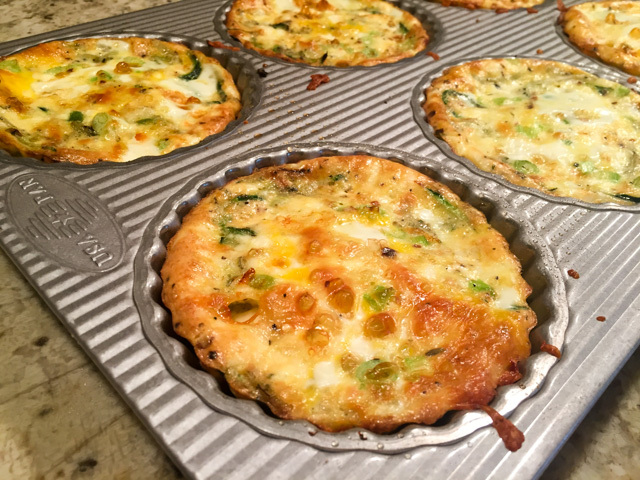 It is so nice to be able to have lunch at home, these tarts go well with just about anything. Kalyn conceived them as breakfast items, but since I don’t normally have breakfast, they turn into a perfect lunch item. Of course, the possibilities are endless as far as what other goodies to add… sun-dried tomatoes, Kalamata olives, maybe some prosciutto or diced ham. Just add whatever you like to the sautéed zucchini and proceed with the recipe. EIGHT YEARS AGO: Greens + Grapefruit + Shrimp = Great Salad! Sally, Thanks so much for the recipe and the new pan. I bought one, and finally made your(almost) recipe. I added one leek because I had them, used low fat buttermilk, instead of cream, but the rest was the same. I also made four instead of eight. They cooked beautifully in the pan, pulled away from the edge just enough for me to get my spatula in and exit them perfectly. Very excited about this recipe as I think it will be perfect for my vegetarian granddaughter, when they come for visits. I served the tarts with a great jared salsa which is organic and heavy on cilantro and garlic. Very yummy! Wonderful!!!! So happy it worked well for you, and I am sure your granddaughter will enjoy too! Great idea, this would be wonderful for a crowd as well. Love the mini tart pan. I’ve pinned it. I don’t like too eggy either, although I’m not sure how to define it precisely, I just know it when I eat it. My 2 pie pan tarts are sitting waiting on the oven to heat up. Results forthcoming…..
wonderful! Hope you will love it and find it not “too eggy” – I also have a hard time defining, but when I taste it, I realize that’s what turns me off a bit. 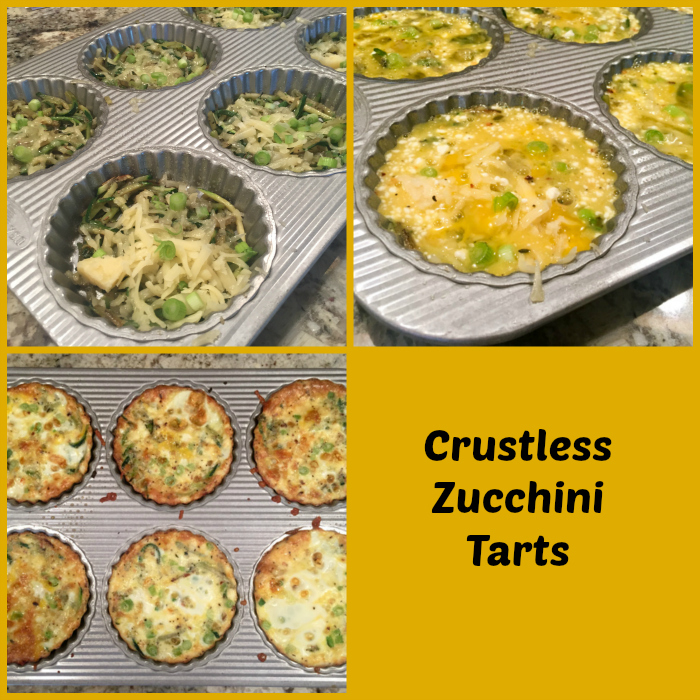 Made a few substitutions, mainly instead of zucchini, I used light green summer squash and added a little chopped red papper and extra spice. No eggy taste, and very light texture. Perfect for toting to work for breakfast or lunch. Great results, thank you very much for this recipe! thanks for coming back with feedback, and so glad you enjoyed it – food and taste are so personal, I am always afraid of endorsing something highly and disappointing, but glad this time it worked for you too!